Decades after the original Jurassic Park failed before opening, new owners have been operating the hugely successful Jurassic World theme park for many years. When a secret military project on the park island fails, a genetically engineered dinosaur breaks free on a rampage and threatens the lives of all guests and staff on the island. The original Jurassic Park (1993) remains one of the most deftly-made crowd-pleasers in Hollywood history, as well as one with an enduring popularity. After all, who doesn’t like carnivorous dinosaurs rampaging around a jungle eating people? Its first two sequels essentially offered diminishing returns, although I have a huge amount of affection for The Lost World‘s (1997) much more cynically and comically bleak outlook. Jurassic World, the fourth film in the series, came to cinemas 14 years after Jurassic Park III. The pent-up nostalgia drove audience demand to make it a huge commercial hit. This is perhaps mildly unfortunate, since Jurassic World is kind of terrible. It honestly seemed quite a bit better three years ago, but with the benefit of hindsight its flaws are readily apparent. It hews very closely to Jurassic Park in its visual language, with countless shots, set-ups and action sequences revealing a little too much of the original dna. It suffers while doing that, because while Spielberg’s film utilised a tight roller-coaster structure (methodical, slow build-up for an hour, then a non-stop thrillride to the credits) director Colin Trevorrow’s sequel has a story that is a little too muddled and complicated. The pace is all over the place, jumping from life-or-death chases to leisurely character moments without any sense of consistency. With this film severely sub-par to the original, every callback and reference simply reminds the audience of an earlier and much better film. Where the film does attempt to out-do the original, it flounders. 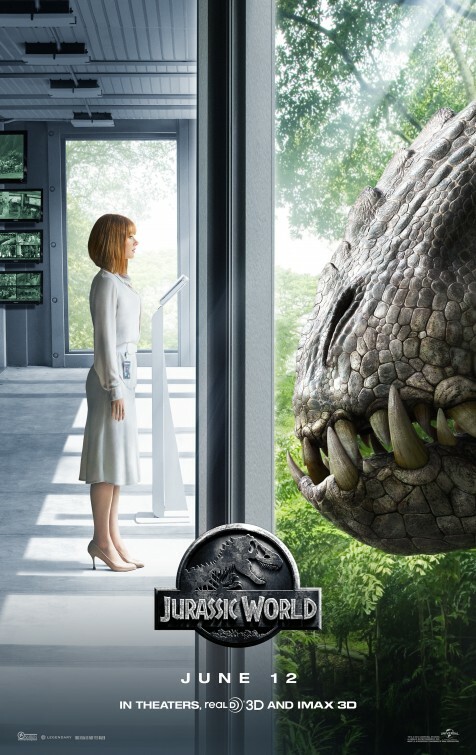 The Indominus Rex – a human-engineered cross-breed of T-Rex and other animals – does not have the scary quality that the screenplay requires. That screenplay misjudges audience desires: we don’t need a bigger-and-badder T-Rex, we just want to see the T-Rex. We do get one during the climax, but it feels significantly less effective this time around. The animatronic/CGI hybrids of Jurassic Park and The Lost World still surpass it by far. Its second-largest problem is Claire Dearing, the female protagonist played by Bryce Dallas Howard. She is actively unlikeable and woefully out-of-date. The film presents her as pent-up and frigid, in a dull contrast to Chris Pratt’s manly and charismatic velociraptor trainer Owen Grady. She is depicted as a brittle career woman uncomfortable around children, and her focus on her job ahead of family feels like it’s portrayed in a judgemental fashion. Howard does an excellent job with a bad role, but she has been let down from the start. Worst of all, this film is cruel. A lot more dinosaurs are seen to be attacked and eaten by other dinosaurs. Character deaths seem more prolonged and unpleasant. The worst sequence of the entire Jurassic Park franchise occurs when Zara (Katie McGrath), Claire’s personal assistant whose only failure in the film is to let Claire’s two nephews run away from her, is picked up by a pterodactyl, dragged into the air, dropped, picked up again in mid-fight, thrown in the air, fought over by two pterodactyls, dropped into the water, picked up again, dropped again, almost drowned, picked up, and then eaten by an enormous mosasaur. The sequence takes an interminable amount of time to play out, and tortures an innocent young woman non-stop for the audience’s entertainment. This breaks the rules of the populist blockbuster. We want to see bad people get punished. In Jurassic Park Gennero is a greedy lawyer who abandoned two children to a T-Rex and gets eaten while hiding in a toilet for his troubles. In The Lost World Dieter (Peter Stormare) tortures small dinosaurs and gets eaten by them an hour later as revenge. These deaths feel right, because bad people are seen to be punished. Zara did nothing wrong; she just got tortured and eaten for being in a bad movie. It, along with much of Jurassic World‘s violence, leaves an unpleasant taste in the mouth. Agreed. Even by the usual low standards of CGI effects-heavy attempts to cash in on a franchise, it’s nonsensical and nasty and makes JPIII look like a classic. The most entertaining part of Jurassic Park III is the background of how they made it. The entire screenplay was apparently dropped when shooting had already commenced. They wrote a new one on the fly based on the constructed sets and actors cast.